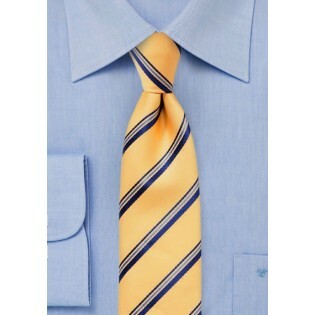 Surprise your peers by adding this golden yellow striped tie your your usual navy business suit. It will instantly create a modern new look that will get you lots of compliments in and outside the office. 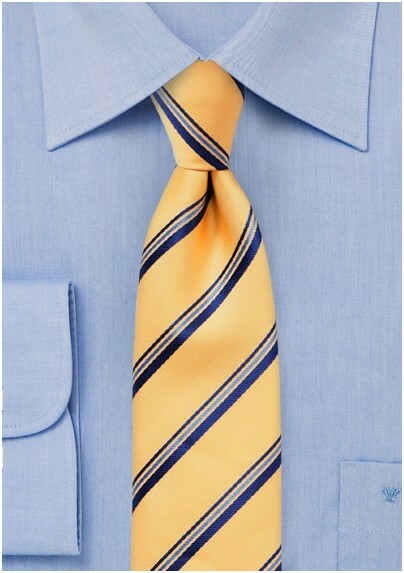 For best looks we suggest this tie with a solid navy suit, light blue micro-check shirt, as well as a matte silver tie bar. Want to further add style to this suggested outfit? Then add a solid white, or light blue pocket square to your suit's breast pocket. Made by hand from woven microfiber.